We are currently recruiting Christian County Medical Professionals to participate in the Medical Reserve Corps. 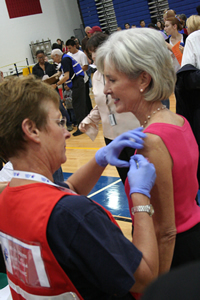 If you should accept a position as a Medical Reserve Corps (MRC) volunteer, you could be called upon to assist with public health efforts in times of special need or disaster, e.g. during a major communicable disease outbreak, an earthquake, flood, or an act of terrorism. MRCs bring volunteers together to supplement existing local emergency plans and resources. Members of an MRC may also want to volunteer their time throughout the year in order to promote community public health and education. Please bear in mind that this position is strictly of a volunteer nature and you would never be required to participate in any event that would cause a hardship for you with either your work or personal situation. The Medical Reserve Corp is a component of the Citizen Corps. The other components of the Citizen Corps include: Community Emergency Response Team (CERT), FireCorps, Volunteers in Police Service (VIPS), Neighborhood Watch and Amateur Radio. During the 2005 Hurricane Season, MRC members provided support for ARC health services, mental health and shelter operations. MRC members also supported the HHS response and recovery efforts by staffing special needs shelters, Community Health Centers and health clinics, and assisting health assessment teams in the Gulf Coast region. More than 1,500 MRC members were willing to deploy outside their local jurisdiction on optional missions to the disaster-affected areas with their state agencies, the ARC, and HHS. Of these, almost 200 volunteers from 25 MRC units were activated by HHS, and more than 400 volunteers from more than 80 local MRC units were activateded to support ARC disaster operations in Gulf Coast areas. MRC volunteers include medical, non-medical, and public health professionals, who are interested in strengthening the public health infrastructure and improving the preparedness and response capabilities of their local jurisdiction. MRC units identify, screen, train and organize the volunteers, and utilize them to support routine public health activities and augment preparedness and response efforts. MRC volunteers include physicians, physician assistants, nurse practitioners, nurses, pharmacists, dentists, veterinarians, mental health professionals, EMS professionals, respiratory therapists, other public health professionals, non-medical professionals, and others who can fill key support positions. fill support roles such as; clerical, greeters, phone operators, data entry, computer technicians, etc. Not everyone can devote alot of time to volunteering. But, we still need these types of professional people. In an effort to accommodate this, we have several different levels of participation and education. Medical background and experience – no license. Tier 1: The tier 1 volunteer chooses to be available only in the event of a large scale public health emergency. Typically, a tier 1 volunteer does not have much time available to attend pre-event trainings or exercises, yet will be expected to fulfill volunteer requirements. Tier 2: The tier 2 volunteer is interested in obtaining additional pre-event training, participating in exercises, and may choose to volunteer in nonemergency public health functions upon request. Tier 3: The tier 3 volunteer is interested in accepting a leadership role within the MRC. Most tier 3 volunteers will be assigned to positions within the National Incident Management (NIMS) structure. Tier 3 volunteers may choose to attend local and out-of-town trainings, seminars and conferences. They agree to participate in planning meetings and exercises, and may choose to participate in non-emergency public health functions upon request. 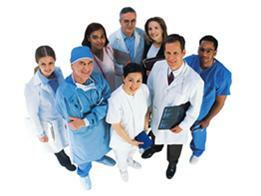 MRC Train is the the premier learning resource for professionals who protect the public's health. A free service of the Public Health Foundation, www.train.org is part of the newly expanded TrainingFinder Real-time Affiliate Integrated Network (TRAIN). 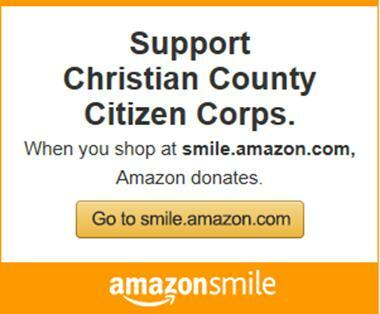 Members of the Christian County MRC will be required to track their training on this web site.